The Exiles begins with the sound of a beating drum behind a montage of 19th century Indian images - sun-baked wizened faces below feathered headdresses, riders single file on the open plains, tepees dotted around like haystacks, in short replaying the Indian stereotype of the 1950s. 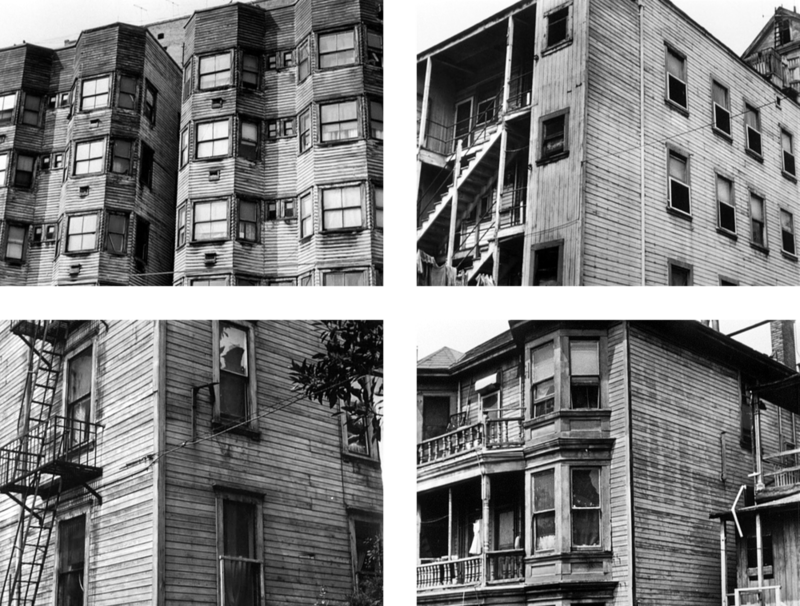 Just as quickly, while tribal chants rise above the rhythmic beat another montage is shown of sun-baked, wizened clapboard lodging houses, badly in need at the very least of a coat of paint, the sort of inexpensive abodes in Bunker Hill where young reservation transplants looking for a better life in the big city could afford to live. We will soon meet such a group. Then ... The steep streets of Bunker Hill imposed a fair amount of climbing on its denizens; for many the Angels Flight funicular, there since 1901 and seen here descending its track, was a godsend. For a nickel a ride a lot of shoe leather could be saved. Off to the side is a clear view of the Hillcrest Hotel and Sunshine Apartments residential buildings. ... and Now, Angels Flight soared alongside and above the 3rd Street tunnel between Hill and Olive Streets at the edge of downtown Los Angeles (map). 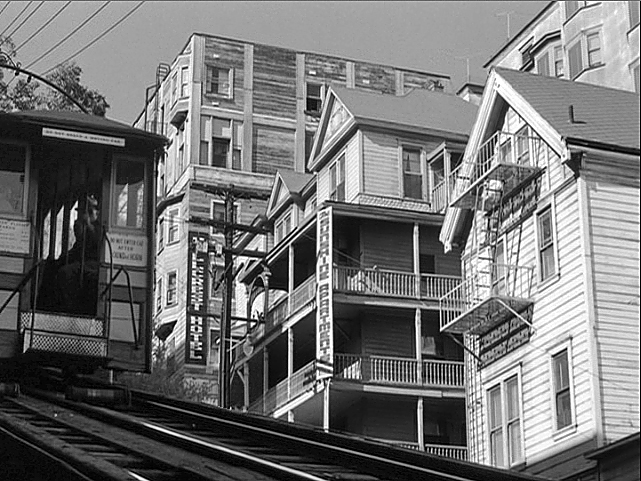 The dotted line indicates the path of the funicular before it closed down in 1969 and the arrow points in the direction of the movie shot above. Today the tunnel has survived but all of the buildings alongside it on both sides were, after being declared unhealthy by the development-driven city government at the time, expurgated. A monolithic building now straddles the tunnel. Progress? Not. Then ... When the funicular reaches its downhill terminus at Hill Street we get a better overall view including the three block tunnel and the upper terminus at Olive a block away. The Hillcrest Hotel and Sunshine Apartments can still be seen from this vantage point on the right hand side. ... and Now, this recent view is as good an example as any of the total annihilation of a neighborhood. 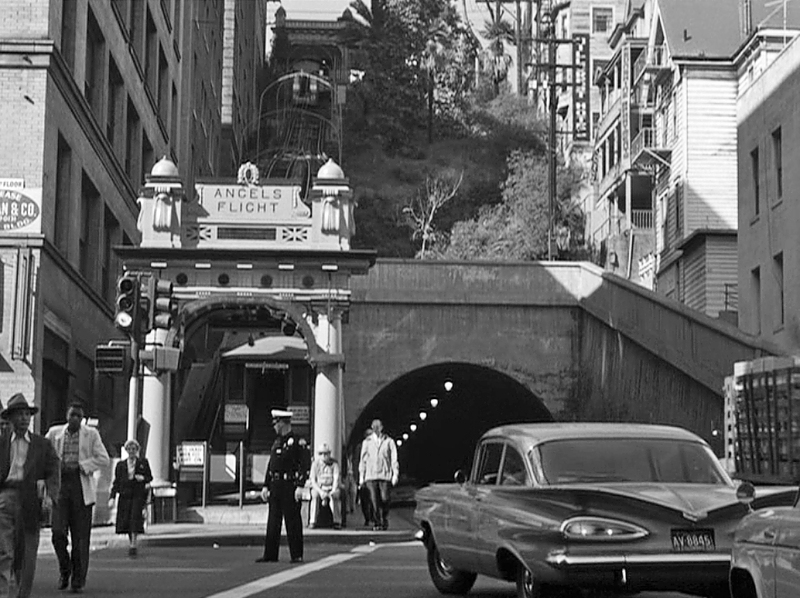 ... in 1962 ... the dissection process was captured in this vintage photo of Angels Flight taken just three or four years after this movie scene was filmed, with all of the buildings to its left and the Hillcrest Hotel and Sunshine Apartments to its right already razed. Let's not even get into the thousands of Bunker Hill and adjacent Court Hill residents who were forced from their homes at this time in the name of urban renewal. ... and Now, Los Angeles gave a nod to nostalgia by resurrecting the dismantled funicular and reinstalling it in 1996 a half block south from its original location, again linking Hill and Olive. After an extended hiatus following a fatal accident the ride reopened - at 50 cents, 10 times the 1950s rate, it is worth it for the memories.